Here’s another painting exercise that I learned from Paul Souza, who taught the “scumbling the lights” method on a previous post. 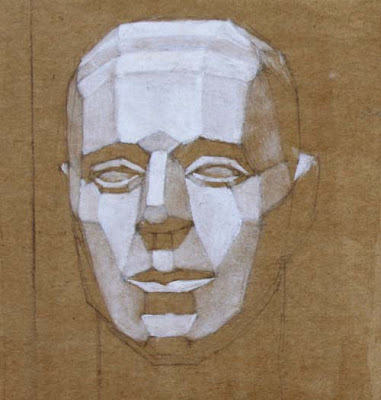 As you look at a real posed model, try to analyze the head in terms of simple planes. State the lines bounding the planes in pencil on chipboard. Seal the board as before, and apply the white oil paint with a bristle brush in varying degrees of thickness until you get the relative tone just right. Leave the shadows untouched by the paint. I recommend that you use this plane breakdown as a guide. Both the forehead and the upper lip are divided into three planes. The chin and the nose each end in a flat shape. The same analysis, in varying proportions and angles, can describe very different face types. If you try this plane analysis, and it just doesn’t fit the face, try an alternate breakdown, but keep it simple. It should look like a puppet being carved from wood, as was stated in the Carolus-Duran post recently. Seeing forms in simple terms helps you to draw or paint them better. As you proceed with a real portrait, you can subdivide the planes and blend their edges. If you establish a portrait in these terms at the beginning, you’re much more likely to get a three-dimensional appearance and a good likeness. we've been doing this type of thing in the figure drawing class I take as a warm up. Though this is more intense. these are beautiful! Actually I noticed when I was experimenting with a 3D program, that you can do a similar thing there, but in 3D. In many 3D programs, there's a 'sculpt' mode that allows you intuitively model your 3D shape like clay. If you start from a cube or sphere with not too many planes, you can focus on basic shape. Once the basic shape is OK, you can 'subdivide' the planes with the click of a button and add more detail. The following video illustrates this, although it already starts with a high level of 'subdivisions' of planes. It's a long video, but towards the end, you'll see that the planes have become so small it almost seems like a smooth surface. I find that playing around in 3D helps in understanding the shape of things, and this actually reflects on the way you think while you are drawing! Another great painter that 'carved out' the planar aspects of the head was the great Cincinnati master Frank Duveneck. He teachings here at the Art Academy where felt all over the American art scene. Joseph DeCamp, one of my favorite American painters, is so strong partly because of his having studied and worked with Duveneck. I too had Paul Souza's class which included this early assignment in planes. Paul dressed in color schemes that were often more memorable than his lectures. 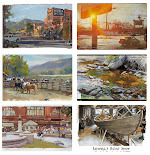 This effective assignment improved everyone's paintings virtually overnight. For that, we were grateful. No question Duveneck, Bridgeman, Riley, and Sargent promoted clear thinking in this area. And then, Leyendecker too. 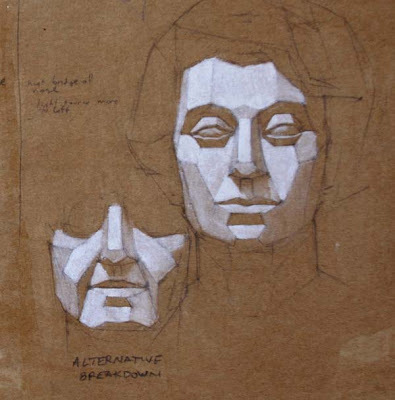 Another, often overlooked, Richard G. Hatton, has excellent passages on the planes of the head ( and more) in his lucid book, Figure Drawing, from the turn of the 20th century. the hardest part is understanding that planes are the surface of a mass and hence have a specfic oriention which truly gives them power. The biggest mistake I have made in my work has been thinking in terms of shape before volume. I think that is why non photographic painters like Michealanglo and Gericult etc are so powerful because every form in the figure maintains and holds it's oriention in space. The planes explain the postion of the volume, they are a product of thinking dimensionally. What an interesting and very useful post. studying planes will efectively improve deeply our drawing. i think it's a good method to push futher our ability to create a volume illusion when we are drawing, or paiting something. i'm always astonished by people who can put down just a few lines on paper, making an arm, a hand, a head "popping out" on paper. they don't draw a character attempt, they just make him appear! to learn character drawing, i wonder now if learning anatomy is the real thing. it's obviously a great help, but i think learning planes is the point. learning structure. it will leads you to a sort of "3D thinking" and it's all you need as a drawer. 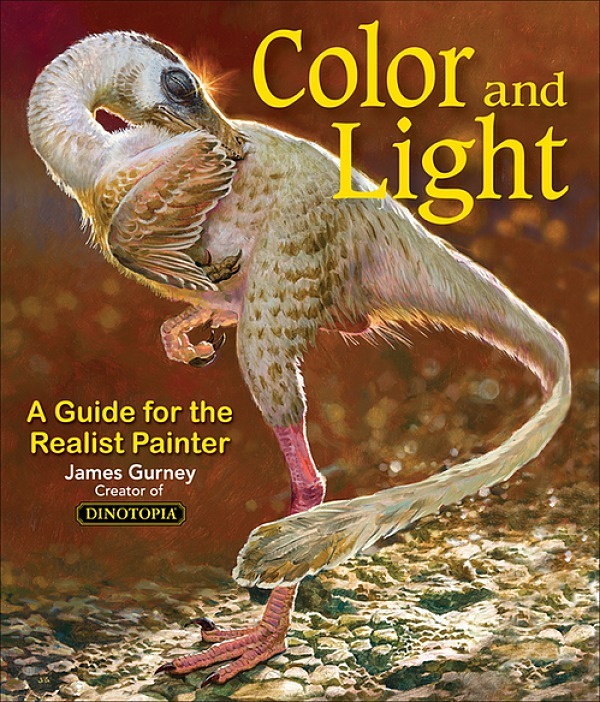 that's why i think bridgeman's books are so helpful, they really improve your 3D sense! I've wondered where Paul Souza got this system - It is similar to Andrew Loomis' plane system for head dwg. Loomis and Souza Lived in the San Fernando Valley- probably knew each other - Loomis studied with Bridgeman- so it looks like Bridgeman-Loomis - Souza. Souza drew the Gunfighter scenes in the opening and closing credits of the 50's TV show "Maverick" he was never proud of this even though he did a good job. When I had his class in the 70's I would whistle the opening bars of the theme from Maverick;(when I knew I could'nt be caught) the watch him look around in great irritation. Jmattos, that's fascinating...I never really was aware of the direct connection, but was just looking at Jeanette's notes from Souza's class, and he recommended Creative Illustration and told us to go look at those paintings at Carter Sexton. He would always talk about the great masters of art history: "Rembrandt, RubENS, and SOUza." Thanks for this post. It's helped me tremendously and i've ordered some Bridgeman books as well because of this.